If you are considering purchasing a new seating system for your venue, or if you are a building contractor, a specifier or a distributor investigating auditorium seating for a client, there are a lot of questions you need to ask before you can get an accurate quote. Here’s a simple guide to getting your seating quote right first time. It sounds obvious, but you need to tell the seating manufacturer what your venue is for. Is it a cultural space, hosting theatre and orchestral concerts, or a rock concert venue? Will it be used for conferences and lectures in an educational environment or it is a sports arena? Is it indoors or outdoors? Or is it a multifunctional space requiring a degree of flexibility for a variety of uses? How wide, deep and high is the space is allocated for the seating system when it is open and when it is closed for storage? Allow 2.2 meters between the top of the stand and the ceiling. Are there any constraints or obstacles which affect the layout? What type of flooring is there in the venue? For example, it could be concrete or resin, glued hardwood on a concrete base, parquet flooring on wooden beams or shock absorbing vinyl. The next consideration is the optimum audience arrangement, which depends on the type of event and the available space. Do you want the seating parallel to the room or at 45 degrees? Would a curved stand help audience engagement? How will the stand be moved? Do the venue managers have the time and capacity to move it manually or would a fully automated retractable stand save time and accommodate more bookings? How much movement is required? Does it just need to move backwards and forwards, rotate or move in all directions? Or will it be fixed? Next we look at how the seats behave. Do the seats need to fold up, or should the seat-backs fold down, or will the seats be fixed (for example, plastic outdoor seating). Will they be folded manually or do they need to fold automatically to save time. 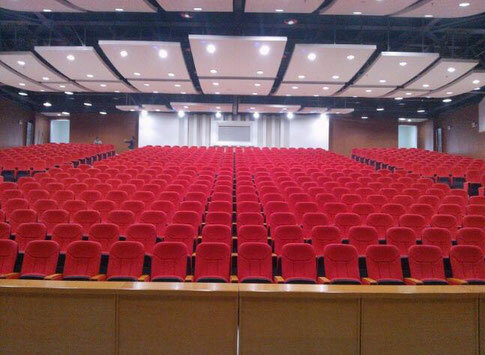 Choose from plastic, wood or padded fabric seats depending on the needs of the audience and the type of event. It is also helpful for the manufacturer to know how advanced the project is – is it at design stage, or tender or are you ready to order? – and when and where installation is required. If you provide as much detailed information as possible at quotation stage, the seating manufacturer will be able to provide you with accurate pricing and timescales as well as expert advice on any factors which you should take into consideration when planning your project.